Hibs had to overcome a spirited Queen of the South to book their place in the last four of the Scottish Cup after an engrossing quarter-final at Palmerston. David Murphy netted just before the break to give Hibs a slim half-time advantage. Two minutes into the second half Queens hauled themselves back on level terms with a fine header from John O'Neill. But substitute Thomas Sowunmi's first goal for Hibs after 51 minutes was enough to separate the sides. Hibs' slick passing had the home side chasing shadows early on, but Queen of the South's awkward resilience turned the battle for midfield control into a tousy scrap. The Doonhamers had the first real opportunity of the game when Jamie Adams was tripped by Chris Hogg 25 yards out. Neil Scally took the resultant free-kick but fired well over the crossbar. Hibernian were then awarded a set-piece of their own for Scally's tug on Michael Stewart's shirt. But Murphy's effort was easily cleared by the home defence. At the other end, Willie Gibson fired just over as both teams pushed for the opener. Hibernian were threatening again when a Queens clearance broke to Stewart on the edge of the area, but his long, low effort deflected a yard wide of target. The home side were undeterred and Simon Brown was then called into action to smother a decent Gibson effort. The game looked set to remain deadlocked heading into the interval, with clear-cut chances few and far between for both sides. But, just on the stroke of half-time, David Murphy stepped forward and fired a blistering left-foot drive low past Jamie MacDonald from 25 yards. Queens started the second-half strongly and were rewarded with a dramatic equaliser. Hibs failed to clear a long throw from Jamie McQuilken and, when the ball broke back to him on the left, his precise cross was met by O'Neill, who gave Brown no chance with his close-range header. But celebrations around Palmerston were short-lived. Within minutes of Queen's equaliser, Hibs had regained the lead when Abdessalam Benjelloun curled a hanging cross from the left into Queen's six-yard box. And, as the Queen's defence froze, half-time substitute Sowunmi left Macdonald flapping in mid-air as he rose above the home goalkeeper to scramble the ball into the empty net. The ball appeared to come off his shoulder and fall over the line, but the end result was all that mattered for Hibs. Hibs were keen to put the tie beyond their hosts and Murphy almost did just that with a superb curling free-kick that was just touched to safety by goalkeeper MacDonald. Queens continued to hustle Hibs all over the pitch but posed little threat in the final third. 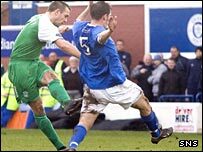 But then, with just over 10 minutes to go, Queens nearly forced a replay when Paton's cross was met by Andrew Bannerman. His volley looked destined for the top corner, but Brown managed to get his fingertips to the ball and push it away. Adams sent the rebound flashing across the face of goal and wide. In the end, there was to be no cup shock at Palmerston as the Easter Road club booked their place in the last four for the third year in a row. Queen of South: MacDonald, Taton, Jim Thomson, Lauchlan, McQuilken, Scally, Adams, O'Neill (Weir 73), Gibson, O'Connor (Barrowman 61), Dobbie. Subs Not Used: Corr, Robertson, Henderson. Hibernian: Simon Brown, Whittaker, Jones, Benjelloun (Lynch 82), Murphy, Sproule, Stewart (Stevenson 53), Beuzelin, Scott Brown, Fletcher (Sowunmi 45), Hogg. Subs Not Used: Grof, Martis. Goals: Murphy 45, Sowunmi 51.